Why not stay with us at OldByreSkye? We have a refurbished two person holiday apartment, rated 4 star by VisitScotland, here on the Isle of Skye that is available year round. Cost varies from £325 to £445 depending on season. Short breaks available off-season. The apartment offers guests all the modern comforts of home with Wi-Fi, iPod docking stations and a large flat screen HD television with satellite TV. There is also a DVD player and a selection of CDs, DVDs books and games for you to enjoy. The kitchen-diner is situated at the far end of the lounge area and is fully equipped with ceramic hob and oven, microwave, fridge freezer, dish washer, and washer/drier. Upstairs is a large bedroom, with a king sized bed. The en-suite shower room incorporates a WC, wash-hand basin, heated towel rail and spacious shower. On the days that it is open, our gallery does not open until 11:00 in the morning, and closes at 17:00 [16:00 out of season], so you should not be disturbed by people coming on site. 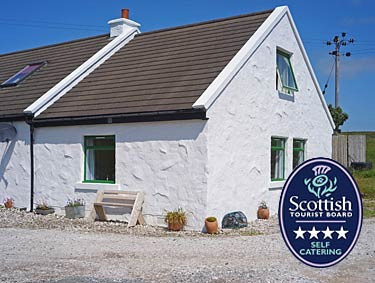 Further details, and booking information, are available on the Islands and Highlands Cottages website.